I used to think of wine sold in boxes as a byproduct of oversupply, cheap plonk that at best would give you a headache after the first sip. I might have been correct in my assumption a decade ago, but not now. Some of the world’s finest winemakers are boxing their lines of inexpensive premium wines and for good reason: customers like the convenience and the savings; the bag-in-a-box wines are better for the environment than bottles; they cost less to produce than bottles and they increase sales. Recent technological advances allow producers to put good wine in BPA-free, eco-friendly vacuum bags that collapse as the contents are poured. The bags keep out oxygen and the wine stays fresh for up to four weeks after it’s opened, according to the producers. Wines that are refrigerated might last longer, but I can’t prove it because I’ve never had an occasion to put the expiration date to the test. Although there are smaller versions, most of the boxes contain 3 liters, the equivalent of four bottles of wine. The ones I buy range in price from as low as $15 on sale for decent California wines to a high of $32 for French varietals and blends, or roughly $4 to $8 a bottle. Boxed wines are great for casual outdoor gatherings, particularly if you have a limited budget. I have served some of them blindly to wine-knowledgeable friends and gotten excellent reviews. Boxed wines also are good for the occasion when you might want another glass after enjoying a finer bottle, or as an everyday house wine to have with a casual meal. One word of caution, however, is that it’s easier to hit the tap on the box than to open another bottle. The ritual of the corkscrew can spark a reflective moment and be a more accurate gauge of consumption. In addition to a lower carbon footprint than bottles, boxed wines don’t leave much to recycle. When the wine slackens, I open the box, take out the bag and squeeze it dry. I put the bag in with other plastic bags and flatten the box for the cardboard bin. La Vieille Ferme wines are among my favorites. When they are on sale, I buy all three by the case, so I was delighted when I discovered it in a box. These well-crafted wines have been produced for more than 40 years by the Perrin Family, a leading maker of wines in the Rhone Valley, including Chateau de Beaucastel and Chateauneuf de Pape. The Ravel family, producers of Chateau Montaud Rosé, has built a reputation over three generations for making high-quality wines in the southeastern corner of France. Chateau Montaud Rosé has well-defined flavors of dried cherries, herbs and minerals with hints of white pepper in the crisp finish, the tasting notes say. These wines are imported by Rafael Flores at Artisanal Cellars in White River Junction and are produced by a cooperative. They are well made and have bright fruit flavors and smooth finishes. The ruby-colored red wine is 100 percent Tempranillo and is aged for three months in oak barrels. The medium-bodied white is 85 percent Macabeo and 15 percent Chardonnay. Both of these wines are exceptional bargains. Vin Vault wines are highly rated and award-winning. The Cab is a dry Bordeaux style with black cherry and blackberry flavors. The Chardonnay is creamy and rich with apple and pear flavors. These wines are made specifically to be sold in boxes, the company website says, and are great bargains. 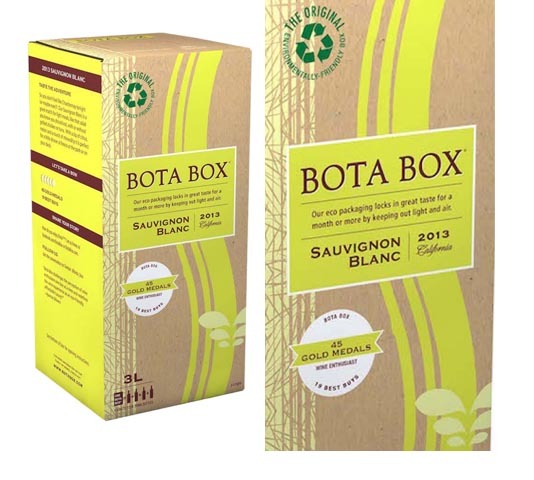 All of the Bota Box wines are well made, mostly dry and a terrific value. You can be safe with any of the varietal offerings, but I particularly like the Sauvignon Blanc in the summer with its juicy flavors of melon and lime and the Chardonnay, featuring crisp apple and lemon flavors, in the winter. The boxes are 100 percent recycled material stuck together with cornstarch rather than glue. Black Box also has a good line of wines. I like the Rosé the most, however. This light, refreshing wine has well-balanced layers of strawberry and white peach flavors. The wines often go on sale for two for $30, which make them a greater bargain. I’ve also tried a couple of very good Bordeaux wines in wooden boxes that make nice birdhouses. They cost around $30 and are not widely available, but look for them in the months to come. In an effort to reach a younger generation, the wine industry is coming up with innovative ways to package products. Boxes, along with cans, are part of that trend. Look for a growing number of good wines to start showing up on store shelves in boxes. But fear not; fine wines with corks will be in vogue for the unforeseeable future. Of course, I said that about newspapers too.